Are you planning on immigrating to Canada? These Canadian immigration job search steps, which include writing a Canadian resume or CV curriculum vitae for the job market, should help you to reach your career goal. Securing a new job is a critical first step to getting settled in Canada. I hope these tips, strategies and professional services will help you find work and enter Canada. Depending on what type of Visa you are using to enter Canada, you may need to secure a job before Canadian immigration accepts you as a legal immigrant. Just so you know, I am not an immigration specialist, but rather a career coach and resume writer. Over the last 16 years, I have helped many clients by writing their resume, CV curriculum vitae, and LinkedIn profile and providing job and interview coaching to help them secure a new position. Over the last 16 years, I have worked with a range of clients including students, recent graduates, health care professionals, information technology specialists, consultants, doctors, pharmacists, oil and gas operators, business managers, and C-level executives. You name it, I am sure I have worked with clients in your field. Writing a resume as an immigrant to Canada will be different than writing a resume to apply for positions in your home country. If you are relocating to Canada through a work permit also called a Canada Work Visa or permanent status these resume writing and job search tips will help. The following Canada job search tips and strategies will provide you will the employment market information, potential qualifications, and understanding of the importance of a Canadian resume to gain employment in Canada. Foreign nationals seeking to enter Canada for work have several options to work in Canada legally. Some families will legally immigrate to Canada and look for jobs once they arrive with the help of immigration services. Other individuals may first obtain a job offer, which will then make them eligible to apply for a work permit. It may be possible to enter Canada as an independent worker if you are self-employed in art, culture, recreation, sports activity, or other designated areas. Business immigrants receive visas in exchange for investing in the economy and creating jobs. Study your Canadian immigration options on the Canadian government website. Once you know what the requirements are, you can organize your job search accordingly. If you work in healthcare, for example, an employment agency or recruiter specializing in healthcare jobs may be able to fast track your job approval to fill high-demand nursing and other jobs. Immigration and citizenship representatives can guide in these early initial steps to making a new life in Canada. Immigrant-serving organizations (ISOs) are the first stop for immigrants looking for employment in Canada. Immigrant organizations provide the full gambit of Canadian job search training and support. Whether you are entering Canada for the first time or re-entering Canada, many job search services are available to you. Use this helpful ISO list to find the closest office in your city. Using proper English and terminology in your Canada resume or CV is imperative to gaining interviews. Also, the resume format you use needs to be suited for the Canadian job market. Incorporate the resume writing tips on this website to make sure your resume appeals to Canadian hiring managers. Review our Canadian resume and cover letter examples. Your experience will determine whether a functional, chronological or hybrid resume is best for you. As a rule of thumb, most experienced professionals use a chronological resume, listing work experience from the most recent jobs held. New college or university graduates, may better present their suitability for a job with a combination resume, highlighting for example related part-time jobs, and summer camp and volunteer experience. Today, job candidate searches are conducted online, so using the right keywords is of paramount importance to ensure your resume pops up in a job candidate search. See more on online resume formatting under online job banks below. If you are entering Canada with a professional or trade designation, an assessment is required to determine if you qualify to work in the same capacity in Canada. The respective governing bodies perform this determination, and depending on your occupation, the evaluation may be conducted at the federal or provincial level. A lawyer, for example, is required to qualify according to the regulations of the province they practice law in. If you plan to work in your current profession when arriving in Canada, conduct research to determine if you need retraining before immigrating. It is not uncommon for foreign professionals to have to upgrade or even redo a degree in their new country. The Canadian government is working to streamline the credential assessment procedure. Nonetheless, the process of having your foreign degrees, professional certifications and other training assessed can be lengthy. Start the process early. See the Job Bank link below to find out which agencies to contact for your occupation. Start by contacting the provincial and national accrediting bodies for your profession. If, for example, you are a lawyer wanting to work in Ontario, contact the Law Society of Canada and the Ontario Law Society for guidance. Your level of English could affect your ability to get a job. Some jobs such as retail clerk positions provide an excellent opportunity to improve your English skills. Others will require perfect fluency. Last I heard, the government provides free English language training. Consider enrolling in one of these courses early. Your multilingual abilities will be a great asset to many employers in the global marketplace. Fluency in English may be required for many positions. If you are turned down from being hired for a new position due to your English language skills, you may wish to take additional training. Knowing the demand and demand growth forecasts for the job positions you are seeking can help you tailor your resume and job search strategy to the targeted position. 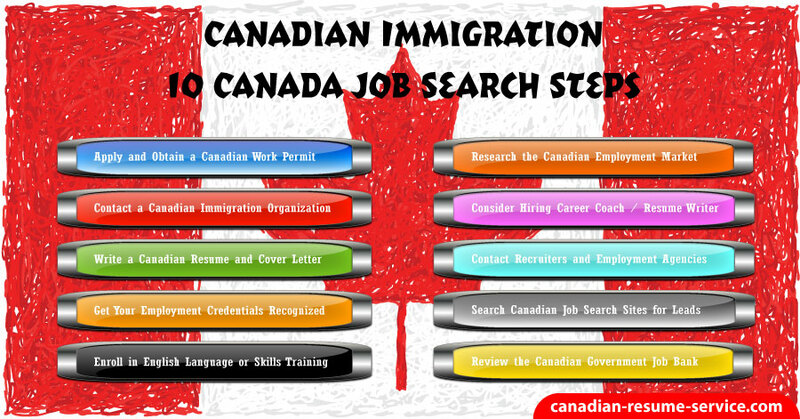 Start your job market research before entering Canada. You may, for example, locate to Ontario only to discover there is a high demand for your engineering skills in the oil and gas sector in Western Canada. Job research can also give you a head start on upgrading your qualifications. For example, if there is a demand for emergency nurses, but all other nursing position growth is stable over the next few years, you always have the option of pursuing specialized training to improve your emergency nursing qualifications. Training could range from taking a university course at night school or online to workshops running from a half day to a week. Some immigrants return to school full-time, and may even redo a degree. A career coach and Canadian resume writer can help you become acclimated to the job market in Canada. Don’t underestimate the power of what a keyword-rich, accomplishment-based visually appealing resume or CV curriculum vitae can do to speed up your job search. LinkedIn is another excellent resource to generate job leads. A searchable LinkedIn profile will increase your chances of being found and ultimately interviewed. If you need help writing your LinkedIn profile, resume, cover letter or any other job search document connect with me, Candace Alstad-Davies. If you have recently immigrated to Canada, it is a good time to reassess and realign your career path and objective and make a fresh start. In addition to Canadian government employment agencies, you will find many private employment recruiters willing to screen resumes and submit them to clients if qualified. These recruitment agencies typically receive a fee from the employer for finding the right job candidates for a position. If you have qualifications in demand in the marketplace, they have every incentive to help you find a job. Ask each employment agency you deal with to review your resume package. Canadian recruiters and employment agency workers review hundreds of resumes and have their finger on the pulse of what employers are seeking in job candidates. If you take the student route to Canada, you will benefit from job counseling, and possibly apprenticeships and internships, offered by your educational institution. As a graduate from a Canadian educational institution, you may be eligible for Express Entry. Online job search sites allow you to search for jobs available in Canada by industry sector, job position, and region. Most of these sites have the option of posting your Canadian resume. Ensure you have the correct format. Registering your resume makes the process of applying for jobs more efficient. And, importantly, it allows employers to find you by searching the website’s database of resumes. Relevant websites may include LinkedIn, Indeed, Workopolis, Monster, Hot Jobs, and Wow Jobs. This search for qualified applicants to interview is performed using keywords. Understanding how applicant tracking systems (ATS) screen resume for keywords to find potential candidates to interview will increase the chances of your resume being chosen. Locate the regulatory body for your professional/trade qualifications. Use the job matching service to find employer sponsors. Receive job reports on jobs available, skills required and wages by region. Access an abundance of useful job search resources. Before visiting the Job Bank near you to get help with your Canadian immigration goal, review what documents you should bring with you. Develop a well-targeted Canada job search by using the many helpful Canadian immigration job search resources listed in this article. Embarking on your new life in Canada is exciting and hopefully, with these resources, you will find success quickly. The myth of immigrants being stuck in dead-end jobs in Canada is largely a product of the career decisions made by the individual. Continue to evolve your career and skills by taking language training and skills training. To make your Canadian immigration experience easier ensure the job search documents you submit to potential employers are targeted to the Canadian job market. Targeting your documents will increase your chances of landing interviews and job offers to enter your dream job in Canada. Consider hiring me, Candace Alstad – Davies, the owner of this website, and work with clients around the globe. I’m a professional Canadian resume writer, job search specialist, interview career coach. Take the time to review our package and services. Previous post: Is Your Resume Grabbing Attention for the Right Reasons?